Email or call to see if we have one in stock if you need it soon as we don't stock a lot of these. 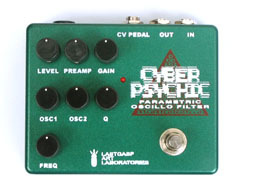 Analog Man carries the "CYBER PSYCHIC parametric oscillo filter" (CP) is a parametric filter pedal with it's own internal oscillation system. The parametric filter is a filter effect that changes the tone by passing only the signal of specific frequency bands, thus cutting the signal of other frequency bands. It creates sounds by mixing the input signal with oscillation sounds. These oscillatiing sounds are created by a combination of three self-generated oscillating systems within the pedal. Its a reconstructed parametric filter that can add new dimensions to (rather than subtract from) your sound. It could also be called a synthesizer with it's oscillation features. *There is the possibility that sudden, strong and unexpected oscillation will occur during the operation of this pedal. Be ready to control the LEVEL at any time. GAIN controls the overall gain level, it makes a distortion sound and controls the sensitivity of the oscillation. The resonance becomes sharp when Q is turned to the right. At it's sharpest point it will begin oscillating. *Turn the OSC1, the OSC2 and the Q slowly, as it tends to begin oscillating suddenly. On the top side, there are jacks for an INPUT, an OUTPUT, a CV PEDAL and an AC ADAPTER. The CV PEDAL jack can be connected to a CV pedal for "FREQ" alterations. If you have a foot CV pedal, you can control the "FREQ" with your foot. The "CV pedal" (Control Voltage pedal) is also known as an "expression pedal". Unfortunately, we do not manufacture these pedals yet. Some manufacturers make "expression pedals" and almost all of them can be used in combinations with our pedals, but effects will vary depending on the manufacturer. We recommend using the MOOGERFOOGER "EP-1" for the "CP parametric oscillo filter".